Flexible Bayesian Regression Modeling is a step-by-step guide to the Bayesian revolution in regression modeling that can be used in advanced econometric and statistical analysis where datasets are characterized by complexity, multiplicity and large sample sizes. 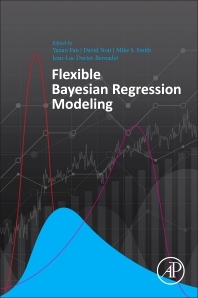 The book reviews three forms of flexibility, including methods which provide flexibility in their error distribution, methods which model non-central parts of the distribution (such as quantile regression), and models that allow the mean function to be flexible (such as spline models). Each chapter discusses the key aspects of fitting a regression model, including variable selection, identification of outliers, assumptions, informative output, and interpretation of results. This book is particularly relevant to non-specialist practitioners with intermediate mathematical training who are seeking to apply Bayesian approaches in economics, biology and climate change. Dr Yanan Fan is Associate Professor of statistics at the University of New South Wales, Sydney, Australia. Her research focuses on the development of efficient Bayesian computational methods, approximate inferences and nonparametric regression methods. Prof. David Nott is Associate Professor of Statistics at the National University of Singapore. His research focuses on Bayesian likelihood-free inference and other approximate inference methods, and on complex Bayesian nonparametric models. Prof. Michael Stanley Smith is Professor of Management (Econometrics) at Melbourne Business School, University of Melbourne, as well as Honorary Professor of Business Analytics at the University of Sydney. Michael’s research is in developing Bayesian models and methods, and applying them to problems that arise in business, economics and elsewhere. Jean-Luc Dortet-Bernadet is maître de conférences at the Université de Strasbourg, France, and member of the Institut de Recherche Mathématique Avancée (IRMA). His research focuses mainly on the development of some Bayesian methods, nonparametric methods and on the study of dependence.